Drag is every swimmer’s worst enemy, one that yields only grudgingly to strength, conditioning and determination. Speedo is giving top-tier swimmers a new weapon in that age-old fight, one it claims pushes the frontiers of swimwear. Speedo says its Fastskin3 swimsuit, cap and googles are the most streamlined ever. The company, which invested four years and 55,000 man hours developing the swimwear, claims it produces a 16.6 percent reduction in full body passive drag. It is the biggest advance in swimwear design since the International Swimming Federation banned polyurethane body suits two years ago. It’s that reduction in drag that Speedo touts in selling Fastskins3. Tom Waller, who led Fastskin3?s design, said he observed less disruption in the water when swimmers first tried the swimwear system. Speedo unveiled Fastskin3 at the Skylight SoHo studio in New York earlier this month with Ryan Lochte (pictured above), Michael Phelps, Natalie Coughlin and other American swimmers on hand. “I feel like a superhero [wearing this],” Lochte, a six-time Olympic medalist, said of the suit the U.S. Olympic swimming team, among others, will wear this summer during the Olympic Games in London. Waller explained that passive drag occurs when the swimmer is submerged, and it is a measure of swimsuit resistance (skin friction drag) and the swimmer’s body shape (form drag). Conversely, active drag occurs at the water’s surface, where swimmers spend most of their time. A swimmer has one additional force to combat at this level — wave drag. The system’s primary component, the suit, is comprised of what Speedo calls “3D Zoned Compression.” Each suit features three compression zones, with the percentage of lycra ranging from 30 percent in the least-compressed areas to 60 percent around the chest, buttocks and legs. A contributor to forming a “straight line” is the “Body Stability Web,” which is among 12 patents Speedo sought for Fastskin. Its framework includes bonded or sewn power seams that reduce water resistance and increase comfort and strength. Comfort is a significant issue. The men’s suit consists of a pair of knee-length trunks, but the women’s version is a bodysuit entered through the neck hole and pulled on like a pair of pants. Waller said it took swimmers as long as an hour to put it on the first couple of times they tried it. That timeline has been shaved down, but getting into the suit remains a chore. “Once I get used to it, I think I can whittle it down to 10 minutes, but this takes about 15 to put on,” Coughlin (pictured at right), an 11-time Olympic medalist, said. The cap and goggle aren’t as high maintenance. 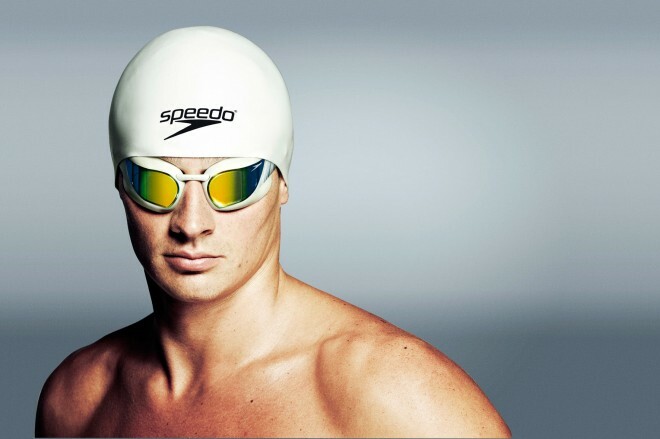 Speedo used 3-D head scan data in shaping the silicone cap, which Waller said conforms perfectly to a human head. Waller’s team found 95 percent of the world’s population has heads that are roughly the same shape. The differences come down to size, which can be classified as small, medium and large. That allowed Speedo to design a cap that doesn’t bunch up at the top of the head, thus reducing drag. A hair management system for women, similar to the teardrop shape of cycling helmets, permits shaping the hair along the back of their head and neck instead of bundling it atop the head. “We’re the first to take proper head-scan data from Asian and Western populations and put appropriate seals for their faces,” Waller said. The goggle’s outer profile, made of a standard polycarbonate lens and thermoplastic rubber with a silicone strap, is shaped to enhance peripheral vision. That allows swimmers to more easily chart the location of their opponents. A “Dive Stream” profile cuts through water more easily; Waller said that normal goggles typically induce water resistance that is tantamount to stacking a pair of Coca-Cola cans on top of each lens. No such force is loaded onto these swimwear components, which is why Lochte felt emboldened to compare his efforts to that of a superhero. He and his teammates will have their chance in London to show if that statement has a measure of reality to it.